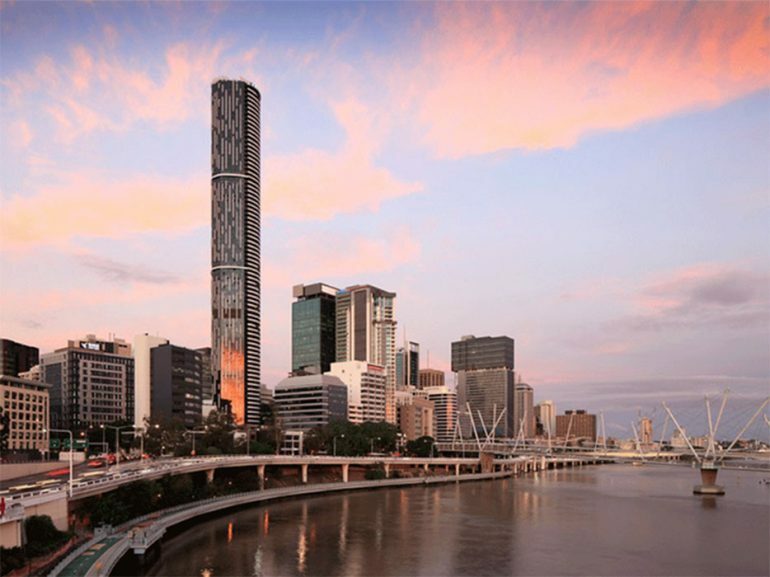 Brisbane’s tallest building, the 81-storey Infinity tower built by Meriton, has been named ‘Best Residential High-rise Development’ in Australia at the Asia Pacific Property Awards, reported Property Observer. No fewer than 70 judges honoured the building for its “crisp” facade, with vertical white sails on one side and horizontal spandrels on the other. Located on what was a ground-level carpark at 43 Herschel Street on the edge of the CBD, the building’s views cross the city from the forested slopes of Mt Coot-tha, over the Brisbane River and out to Moreton Bay. Residents in its 549 apartments enjoy a lap pool, spa, sauna and gym. Two hundred and fifty nine apartments are fully furnished and serviced for short, medium or long stay-visitors wanting the comfort of a home away from home. The two-bedroom apartments sold out in the mid-$600,000 price range. Only one three-bedroom apartment remains at $918,000. One-bedroomers are available from $405,000, or $415,000 with study. Investors can expect rental returns of $420 to $430 on one-bedroom apartments, and $530 to $580 for two bedrooms, depending on whether the unit has one or two bathrooms.